Treat Mom to a surprise that’s as cheerful as it is delicious! 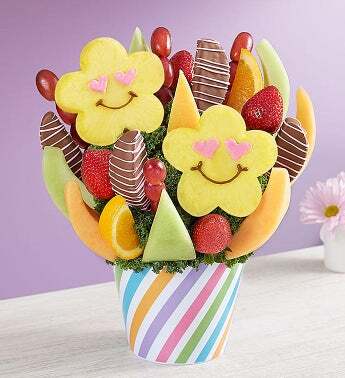 Our abundant arrangement of fresh fruit features juicy daisy-shaped pineapples decorated with pink chocolaty heart eyes and brown chocolaty smiles with a mouthwatering mix of strawberries, apple wedges and more. And to bring the celebration to new heights, add a festive Happy Mother’s Day balloon!